Nestled in the prestigious Shea Corridor of Scottsdale, Arizona, you’ll find the remarkable community of McCormick Ranch. The Shea Corridor is so named because of its location near Shea Boulevard in Central Scottsdale. Home to the so-called the “Resort Corridor,” this remarkable area boasts numerous resorts with impeccable amenities and highly desired real estate. The master planned community of McCormick Ranch is comprised of 3,100 acres of gorgeous real estate options. Once an actual ranch, the area was purchased by developers in the early 1970’s from the McCormick family. McCormick Ranch is a community between Shea Boulevard and Indian Bend with lush green grass, mature trees and glistening lakes. The condos, townhomes and single family homes found in McCormick Ranch come in a variety of sizes and styles and vary in price, ensuring all prospective homebuyers find a home that suits their tastes and budget. One of the most noteworthy condominium communities in McCormick Ranch is called Corriente. Corriente is an upscale condo with 192 homes ranging in size from 1,048 to 1,547 square feet. Rancho Antigua is another great condominium community in McCormick Ranch. Rancho Antigua was recently remodeled and features a fitness center, tennis courts, three pools and an impressive clubhouse. On the lake in McCormick Ranch you’ll find the townhome community of Las Palomas. Las Palomas boasts great shared amenities like fountains, a pool, spa and tennis courts. The Santa Fe neighborhood in McCormick Ranch is comprised of one-story and two-story patio homes and townhomes with garages. The smaller community of Villa Royale at McCormick Ranch is in walking distance of the Mercado Del Lago shopping center and has homes in upstairs or downstairs units, most facing in toward the common area where the spa, pool and green space are located. Regardless of which McCormick Ranch neighborhood you choose to call home, you too can enjoy all the great advantages of this area. 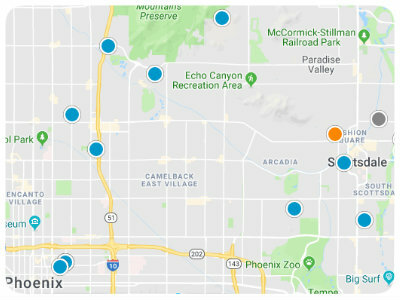 Students in McCormick Ranch are served by the Scottsdale Unified School District with Kiva & Cochise Elementary schools, Mohave and Cocopah Middle schools and Chaparral and Saguaro High schools within the community. Located in the 85258 zip code, McCormick Ranch is just 2 minutes from the 101 Freeway and 5 minutes from the 51 Freeway. You can reach the Sky Harbor Airport and Downtown Phoenix in just 15 minutes. In addition to all of that, McCormick Ranch boasts 25 miles of bike trails, two 18-hole championship golf courses, 130 lakes and several parks. All around, it is just an undeniably wonderful place to call home. If you would like to buy a home in McCormick Ranch in the Shea Corridor of Scottsdale, Arizona, please do not hesitate to contact us today.